Please join us for the launching event of Los Herederos Inc – a new NYC based non-profit organization dedicated to folk art media and digital content, or to put it simply, “inheriting culture in the digital age.” Los Herederos, together with Proimágenes Colombia and Terraza 7 are pleased to present the first ever U.S. – based public screening of the restorative documentary series, Yurupari. Our unique program, “Artist and Archive,” will pair this documentary screening with live music by La Cumbiamba eNeYé “Gaita Ensemble” and remarks by band leader Martin Vejarano, archivist Juana Suarez, and Los Herederos Executive Director Naomi Sturm, on the role of archives and digital media in local music production and the maintenance of cultural traditions. 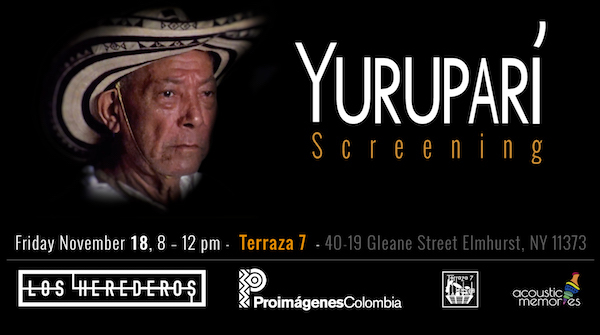 The screening will include two Yurupari episodes, “ Flutes and Drums of San Jacinto” and “ Marimba of the Spirits.” In addition to raising awareness about the importance of digital archive re-masterization we want to promote and make accessible this extensive and richly diverse Colombian ethnographic collection amongst the local community. This program is free and open to general public. We look forward to seeing you at your favorite neighborhood hangout for an evening of great music, film, and conversation. About Los Herederos: Los Herederos (the inheritors) is a non-profit organization dedicated to the documentation and promotion of the personal narratives and complex histories that accompany the arrival and dissemination of folk traditions in New York City. About Proimagines and the Yurupari Series: Yurupari is one of the most extensive and complete audio-visual inventories ever compiled with respect to the ethnographic and cultural diversity of Colombia. The archival collection has been designated as World Cultural Heritage by UNESCO. Several of the archives have been digitally remastered by Patrimonio Filmico and Proimagenes Colombia via a project of the lauded visual anthropologist and winner of the Premio Nacional de Vida y Obra 2015 of the Colombian Ministry of Culture, Ms. Claudia Triana. About Terraza 7: Located in the heart of Queens, NY – directly between Elmhurst and Jackson Heights – two locations containing the most diverse population of working class immigrants on the planet- Terraza 7 is committed to preserving and promoting local artistic and political expressions within the community, based on progressive values. Terraza 7 is one of the neighborhood’s longest standing community anchors and remains a haven for emerging Latin artists in NYC. About La Cumbiamba eNeYé: One of NYC’s premiere Colombian ensembles, La Cumbiamba eNeYé has performed and taught master classes on Colombian traditional music at some of the most renowned venues and institutions in the US, including SummerStage, GlobalFEST, River to River Festival, Summer on the Hudson, Joe’s Pub, Lincoln Center Out of Doors, Harvard, Princeton and Columbia Universities. Known for having collaborated with the likes of Marc Ribot, Dan Zanes, Lucia Pulido and Marta Gomez, La Cumbiamba eNeYé performs in a variety of lineups always delivering lively latin/world dance parties. No Replies to "Artist and Archives: Yurupari Documentary Screening & Colombian Dance Party"